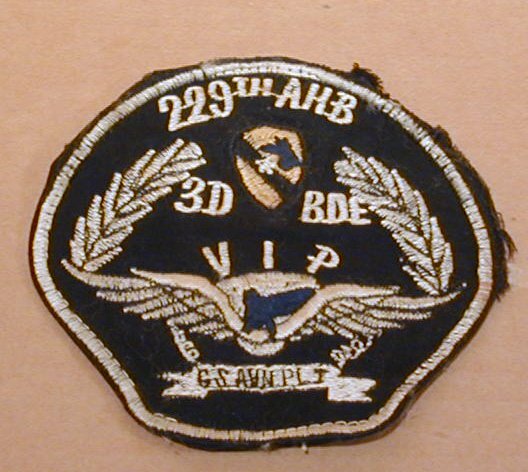 A company, 229th bn - "One day as we were carrying endless loads of Vietnamese into the surrounded city of An Loc, we passed another flight of 5 from our company going back to get some more. 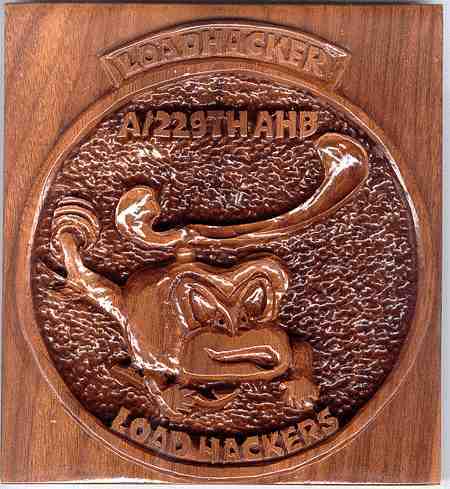 Some one asked "Whatca doing? ", � "Hacking the load" came back and we had Loadhacker patches the next day." Smiling tiger emblem in the O club at An Khe in 67. 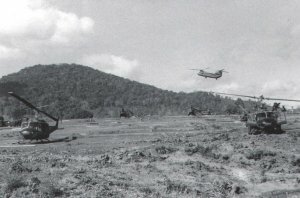 An Khe Army Airfield, September 1965. 2 Huey slicks of the 229th AHB, find landing space on a partly cleared area of the ' Golfcourse' landing strip. In the background, a chinook helicoptor of the 228th ASHB overflies a row of its Battalion ships, awaiting their loads. 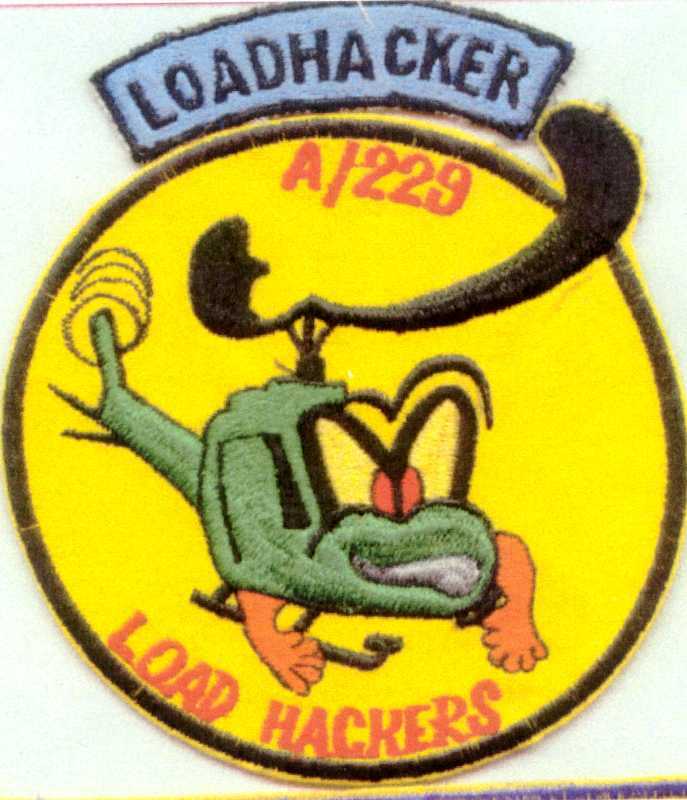 An-Khe Army Airfield, October 1965. Huey Helicoptors of B - Company 229th AHB, jockey for position on their make shift landing strip. 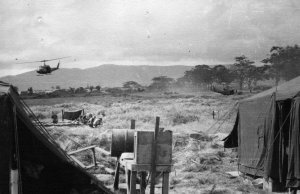 Note at this early stage of deployment, the basic washing facilities and GP tent living conditions. 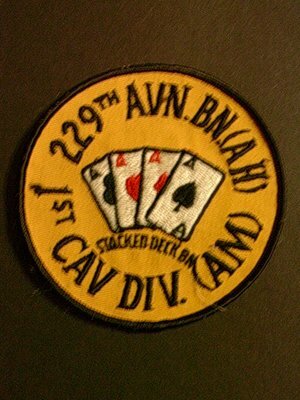 Early "Stacked Deck" version of the 229th patch that was made stateside. 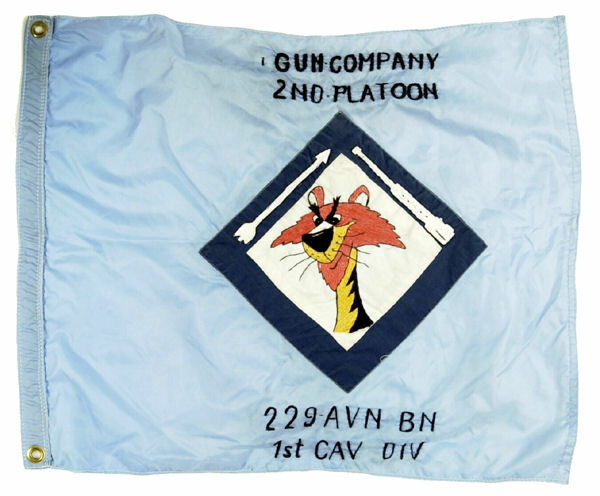 The D/229th flag was made in the village of Bong Son near LZ English sometime in the summer of 1967. 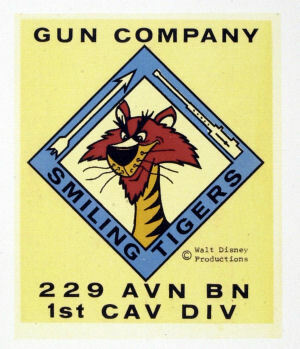 I gave one of of the enlisted guys in the 2nd platoon (who would sneak down to Bong Son more than he should have) a decal of the "Smiling Tiger" and someone in the village made the flag. 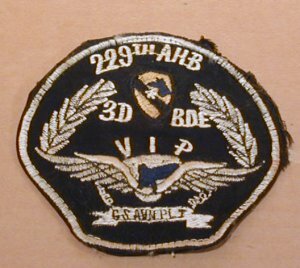 I think it cost me around $50.00, alot of money in Vietnam in 1967, thats how I ended up with flag. 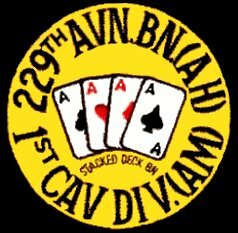 A few of the guys were upset when I took it home but not a soul chipped in when I suggested we have a flag made and split the cost. Original decal produced for members of the 229th Gun Platoon - "The Smiling Tigers". 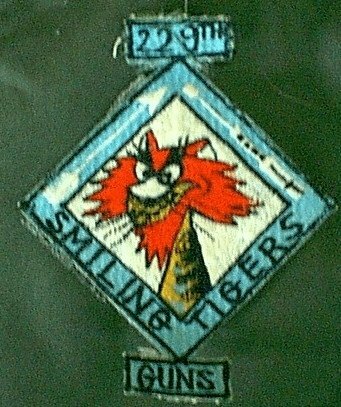 This decal provided the inspiration for the flag that was made in Bong Son.